Patrice Lumbaba CIA files: What can we learn from the Cables? There are lot of information in the covert operation done by the American Government. It is well known for most that the main supporter and donor to Democratic Republic of Congo was the United States after Independence. This was to stop the Soviet interference during the Cold-War. It would seem most likely that the CIA or any other paid assassins from the US to assassinate the first President Patrice Lumumba, to secure their ally and political beneficiary Mobutu. Therefore, the newly declassified CIA cables, can say a lot that hasn’t be reviled about the plans and how it happen. Take a look! “Appreciate excellent reporting your reference and commend his Alert Rolf. We wish to give every positive support in eliminating Lumumba from any possibility resuming governmental position or if he fails in Leop. Setting himself in Stanleyville or elsewhere. While fully aware of nefarious plotting Ghana, Guinea, UAR. To restore Lumumba, greatly disturbed at reference to and particulary as member of this cliques. Can you suggest any action we can propose to obacid or take otherwise to help detach them from Lumumba” (CIA, August 1960). “We still have political stalemate in Leopoldville, but Lumumba ‘s long-term political prospects may have been boosted by indications of support from UN quarters, and by Mobutu’s insecure hold on Congo army. A. Hammerskjold told Ambassador Wadsworth 15 October he still regards Lumumba as legal premier. Added that he plans to “break” Tshombe by insisting that Belgians and others route all Congo through the UN. 1. Hammerskjold probably softening his opposition to Lumumba in order to keep support of many African states for UN operations in the Congo” (…) “III. Mobutu appears to have dropped idea of reconvening parliament in order to strip Lumumba of his immunity from arrest. Neither side appears confident of strong parliamentary support” (CIA, 1960). “Orientale Province controlled by Lumumba forces since mid-October, despite some opposition from army elements loyal to Mobutu. A. Lumumba, describing situation Orientale, recently observed that “liberation movement in Congo could be launched from there”. Probably hopes to consolidate position there, then build up his following in other areas. B. Lumumba agents, the UAR, and the Soviet bloc continue active in support of this goal” (…) “III. On 28 November, Lumumba partisans in Stanleyville launched sweeping arrests of Europeans, including UN personnel. Most released, but many beaten. UN representative in Stanleyville asked for emergency air evacuation of 1,000 Europeans on 29 November, but request dropped on 30 November with UN reporting Stanleyville “quiet” (…) “Mobutu’s Commissioners decided on 29 November to mount military operations against Lumumba forces at Stanleyville. This would be difficult. If UN unable to prevent such action, result would be a civil war” (CIA, November 1960). “1. Rival regimes in Leopoldville and Stanleyville continue to spar. A. Mobutu hampered by logistical problems operating against distant Oriental province. B. Gizenga threatened by critical shortage food and gasoline in Stanleyville. II. Gizenga has broken Mobutu’s “economic blockade”, however, by moving forces in Kivu Province which should relieve pressure on food supply Stanleyville” (CIA, 1960). “1. Thanks for Patrice. If we had known he was coming we would have baked a snake. 2. Per GOK had no advance word what so ever. Lumumba severly beaten at airport by gendarmerie, then taken Jadotville prison where guarded by all white guards. GOK does not plan to liquidate Lumumba. Fears changes of Balubakat uprsing in Eville considerable increased” (CIA, 1961). “Lumumba fate is best kept secret in Katanga. In addition Embassy demarche to Mukongo to request humane treatment for Lumumba has caused gok make every effort deny firm data to Odyoke, United States. 2. In above context following is review of reports received by Eliz since 17 Jan. A. From dr. De Coster (pediatrician from Stanleyville now living in Eville, we got data from unknown doctor who claims verified death). Lumumba, Mpolo and Ok to executed just off road from Eville to Jadotville on 17 Jan. B. Doctor Lauveau, Belgian Physician with good local contacts, stated on 19 Jan that Lumumba if not already executed was about to be. Mentioned GOK ministers had each been allowed to beat Lumumba first. C. On 1 Feb Commandant Roger Van Der Stock, G-2 Sud Kasai Army, stated categorically that Lumumba dead, but refused reveal source. Said knows man who executed him. D. On 2 Feb Dutch dentist St. Van Baalen, whose wife is secretary Tshombe office, stated definitly Lumumba dead” (CIA, 1961). “Gottlieb testified poison intended for Lumumba came from Agency’s stockpile “… and (was) sent to a CIA agent in the Congo now known as Zaire for use against Lumumba.” Poison plan was never used as Lumumba was killed by unknown assassins in Katanga Province just few days before inauguration President Kennedy Jan 1961. In 1961 Gottlieb headed Central Division which among other things handled requests for poison by agents in field. He confirmed a number of critical details regarding earlier allegations that the Intelligence Agency was involved in trying to poison Lumumba” (CIA, October 1975). So there are clear talks of both project of Poisoning Lumumba, that some sent a message to Washington to bake a snake to him already in January 1961, therefore, there are clear indications that the United States and the CIA was involved in the killings. It is sad that Roger Van Der Stock never revealed his sources and neither who he believed did it. You wouldn’t send this sort of messages from the DRC to Washington if you hadn’t something sinister planned. The United States wanted to stop the fraction run by Patrice Lumumba, who we’re supported and had Marxist view, which was countering the ideals of Washington. That was why the death and demise of Lumumba, fit the US very well and the new puppet dictator Mobutu fit the program. Therefore, anyone with a beautiful mind, would understand the value of assassinate Lumumba, to get loyalty to Washington, instead of Moscow. Peace. “Burundi’s government will not take part in peace talks with the opposition scheduled for Wednesday, which are part of regional efforts to resolve a crisis triggered by President Pierre Nkurunziza’s decision to run for a third term in office. Joseph Bangurambona, the permanent secretary in the foreign affairs ministry said his government holds some of the participants responsible for recent months of violence. VOA’s Vincent Makori reports” (TV2 Africa, 2016). 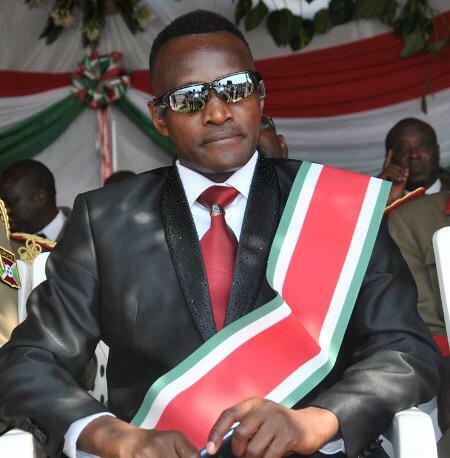 “During a trial of 28 police and military figures, former Burundi Defense Minister Cyrille Ndayirukiye has pleaded guilty to involvement in a failed coup last May” (TeleSur English, 2016). “AU commission chairperson Dr Nkosazana Dlamin-Zuma held talks with the Tanzanian foreign affairs minister in Durban on Tuesday. 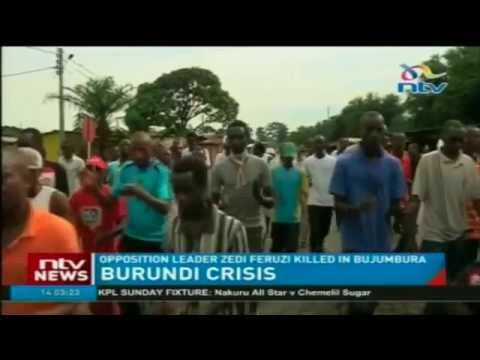 They both discussed the current political crises in Burundi, tension has let to many civilians losing lives as the army and the protesters clashed in some parts of the capital city Bujubura. Dlamini-Zuma has raised concern about loss of life in that country. While Tanzanian foreign affairs minister says peace and stability must be pursed” (SABC Digital News, 2016). The Secretary-General notes with great concern the continuing deterioration of the security environment in Burundi following an electoral period marked by violence and the violation of human rights, including the right to life. 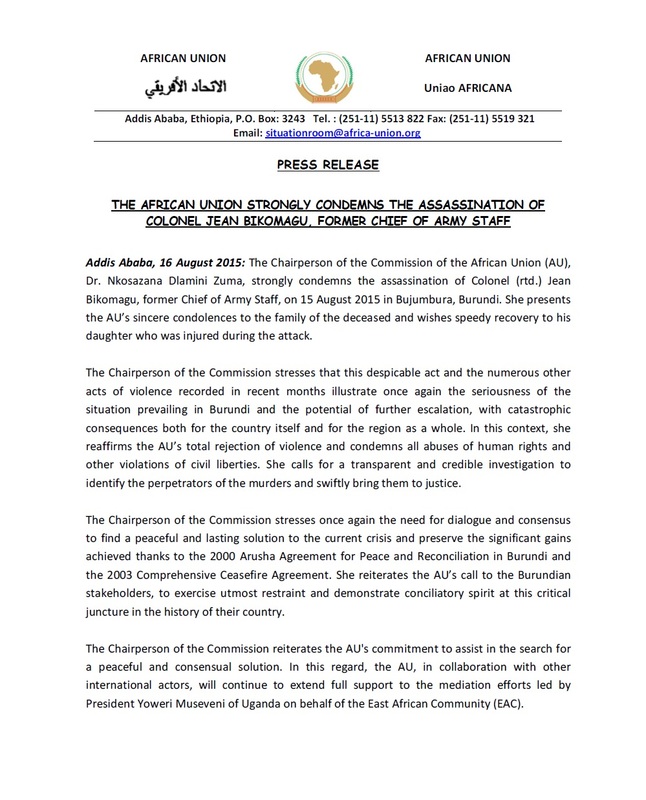 In this context, the Secretary-General strongly condemns the killing of General Adolphe Nshimirimana on 2 August. He welcomes President [Pierre] Nkurunziza’s message to the nation to remain calm and to the competent authorities to expeditiously investigate this assassination in order to bring the perpetrators to justice. 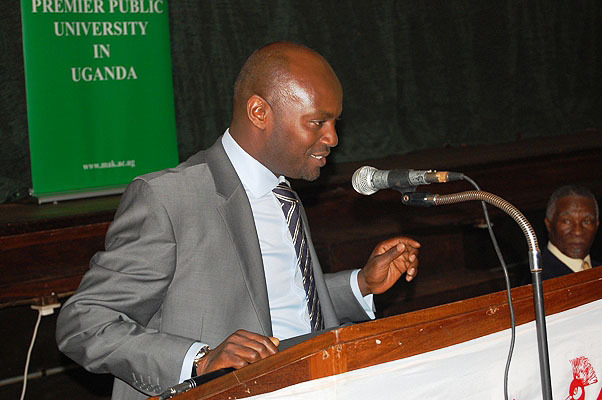 He calls on the Burundian authorities to investigate diligently other recent political assassinations. The Secretary-General renews his appeal to all Burundians to resume an inclusive dialogue without delay and peacefully settle their differences under the facilitation of President [Yoweri Kaguta] Museveni as mandated by the East African Community. The Secretary-General remains committed to supporting peace consolidation and conflict prevention efforts in Burundi. Deputy Prime Minister and Minister of Foreign Affairs Didier Reynders condemns the murder of opposition figure Zedi Feruzi and his bodyguard. 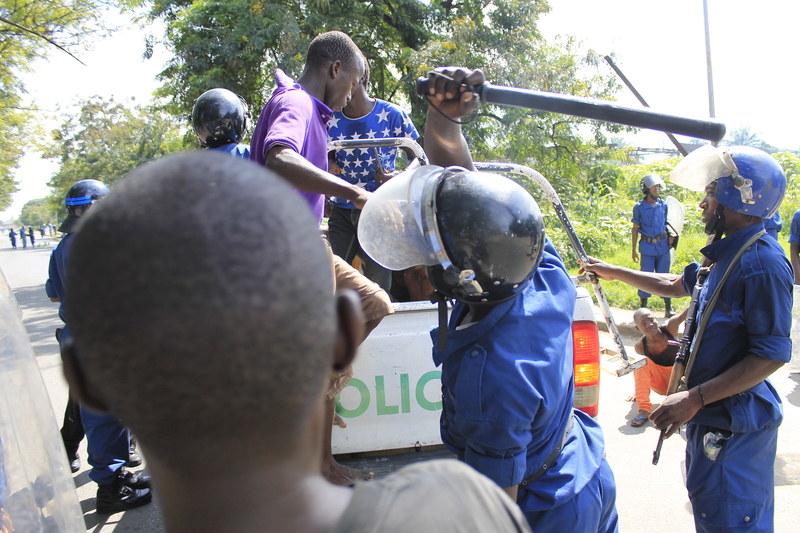 He also condemns the attack on the central market of Bujumbura that killed two and injured many people. He extends his condolences to the family and friends of the victims. Belgium calls for an impartial investigation, under UN monitoring, in order to find the perpetrators and bring them to justice. Didier Reynders calls on all actors to show restraint to refrain from using violence. It is also essential that all stakeholders commit to creating swiftly the conditions required to organise peaceful, inclusive and transparent elections, in the spirit of the Arusha Agreements. Didier Reynders therefore encourages Burundian stakeholders to pursue the consultative political dialogue facilitated by his Special Envoy Said Djinnit and representatives of the African Union, the East African Community, the Common Market for Eastern and Southern Africa (COMESA) and the International Conference on the Great Lakes Region (CIRGL).